3,521 Miles. 13 States. The World's #1 Multi-Sport VIRTUAL Fitness Challenge. 2018 Amerithon Just Launched July 4th! It's Not Too Late. Register Today! Accumulate miles as you run, walk, bike, swim, hike, or even pogo stick across America. Complete the challenge without ever leaving your neighborhood! Complete your miles individually or on a TEAM of up to 8 people - INSPIRE your friends to take the challenge with you! Count Miles since July 4th 2018. No deadline for completion. Take the challenge from anywhere and complete it on YOUR time. Join today! See What Is Included In The Get It All Package! The Amerithon Challenge is a virtual fitness challenge (can be done by anyone, anywhere, and at anytime) but it has some awesome goodies that are shipped to you when you sign up and when you finish the challenge. Below is a full list of all the goodies you can receive when you join the challenge. The Amerithon Challenge medal is a 6 Piece Finisher Medal to commemorate your journey across the United States. Available in a limited edition keepsake box! The Amerithon Challenge Passport is a 20 page journal to keep track of your journey. Place milestone stickers as you reach certain destinations and mark the date you arrive. Use as a visual representation of the physical challenge! The Amerithon Challenge Wall Map is a decorative wall map to hang up and mark as you complete the challenge! Fill in the map line as you complete your miles and travel across America with the rest of the Amerithoners. 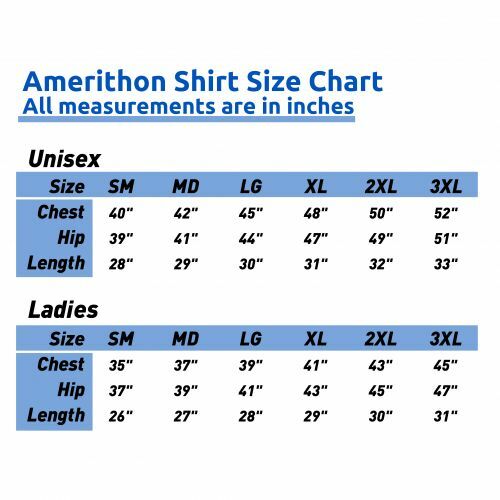 The Amerithon Challenge Shirt is a high quality Tech Shirt and comes in both a unisex and a ladies cut. 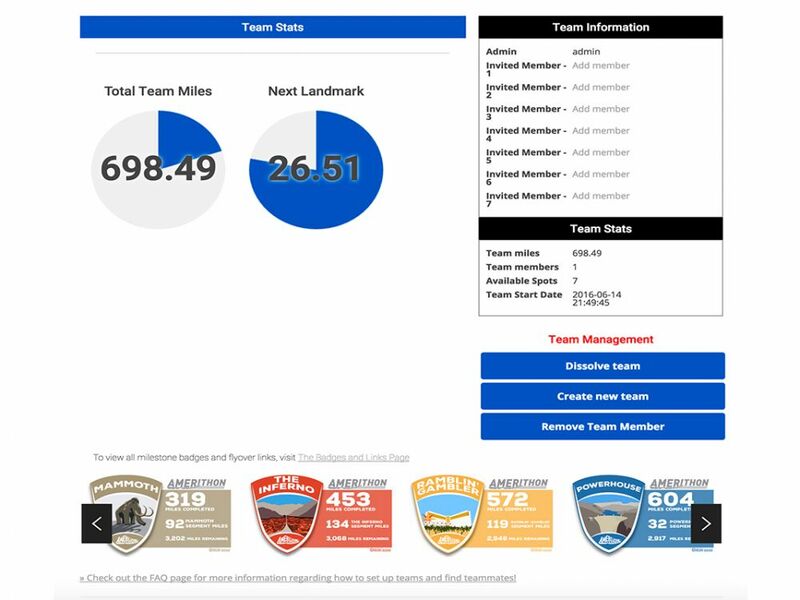 Basic Registration gets you access to your own individual and team mileage/fitness tracker to document and track your journey. Collect landmark badges and break your journey down into 36 bite sized pieces. As you complete the Amerithon Challenge and enter your miles into the Fitness Tracker, you will earn Milestone Badges and Flyover Videos. These are placed throughout your journey to help encourage you and help you visualize how many miles you really are completing! Each milestone is a goal – the tracker will count down your totals until your next milestone. Print out your milestone badges and share on social media to let the world know how far you’ve come! Joining the Amerithon Challenge is easy. Follow the steps below to ensure your spot in the challenge. Registration is open – start your journey today! Remind everyone that runners, walkers, bikers, swimmers, hikers, ANYBODY is welcome! Account credentials will be emailed to you on July 4th so you can log in and start your journey! Account credentials will be emailed to you immediately after registration so you can log in and start your journey! When does the Amerithon Challenge begin? 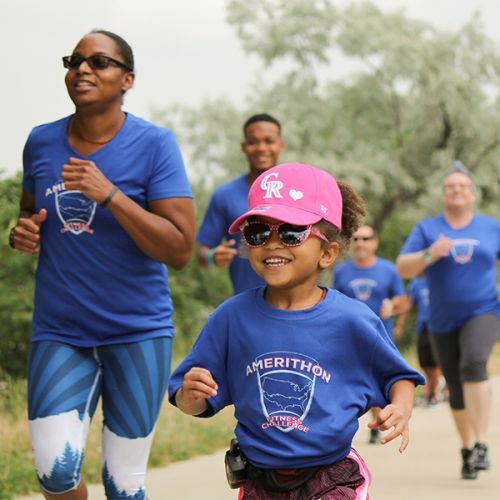 Begin the 2018 Amerithon Challenge on July 4th. Complete the challenge on your time and on your schedule. Registration is open now here. Start today and become an Amerithoner! Is there a time frame for this challenge? Run The Edge encourages Amerithoners to attempt to finish the challenge in a year but there is no set deadline. Is there a limit to the number of team members allowed on one team? Yes, the tracker limits teams to 8 members. What am I allowed to count toward my mileage? ANY EXERCISE MILES count! Your can Manually enter your miles in our tracker or sync your FitBit, Garmin, or Strava account for automatic upload. Miles earned running, walking, biking, swimming, etc. Count whatever miles you cover exercising. How does this challenge effect Run The Year 2018? Miles tracked can be used for both challenges. Of course. Simply choose to participate internationally at registration to ensure your swag ships to the correct location. Geographic location does not influence your ability to participate in the virtual challenge. When do I get access to my tracker account? The 2018 Amerithon Challenge Begins July 4th. You will get login credentials on that day. There’s a few reasons this could have happened. Email info@runtheedge.com with your email address, first name and last name. Run The Edge has donated over $25,000 dollars to charity partners such as Team Red White and Blue and Wear Blue Run To Remember. There is nothing we enjoy more than working with quality organizations like these to make a difference.